Our good friend, Phout, wearing one of her healing cloths (phaa phi mon). 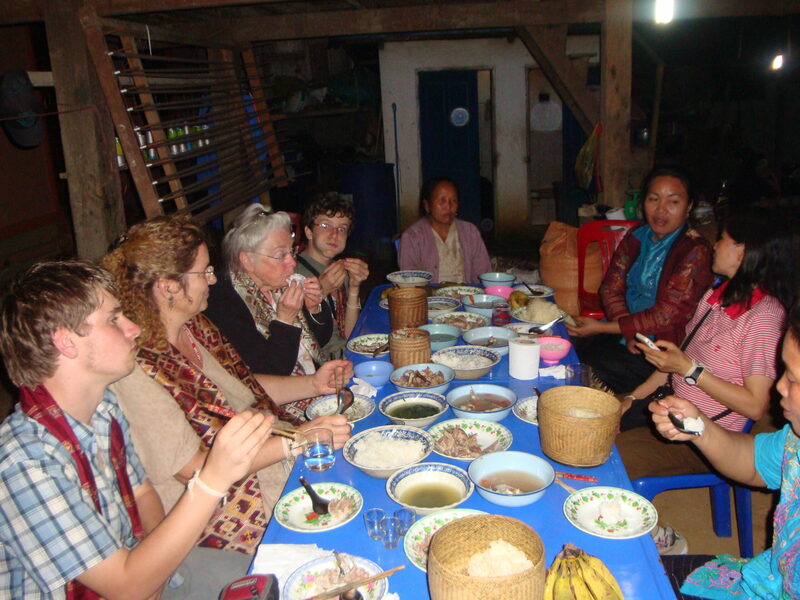 We are in Houaphan Province in NE Laos, getting ready for a dinner with our weaving and dyeing friends. A dozen or so people are already at Souk’s house, the women chatting quietly while chopping garlic and ginger for dinner’s preparation, and the men sharing another bottle of Beer Lao. Then a motorcycle revs into the front, carrying Phout (pronounced “put” with a little bit of an “h” after the “p”) and her husband. Phout charges in, wrestles her too-small helmet off her tied-up hair, and, eyes glowing and teeth exposed, says something in a loud voice that ends with a high-pitched “ooo-eee”; everyone laughs, including us. Phout grabs Maren’s shoulders and gives a quick hug, then offers her outstretched hand to Josh and the boys for a firm deliberate handshake. She continues to talk quickly and loudly and again the room erupts in laughter. Mai, who grew up with Phout and Souk (rhymes with “book”) but later learned English, offers us a quick translation for Phout’s paragraphs of gushing and animated energy. “She says” Mai manages through her laughter, “she says she is so glad to see all of you, and she wishes you to celebrate with us that we are together again.” There is a moment of quiet when the English is spoken. A dozen smiling heads bob as if hearing a toast. The room catches a breath and Phout reaches for a short glass of Beer Lao offered from her smiling husband. She raises the glass slightly in both hands, does a quick, honorable dip to acknowledge the celebration, and drains the glass quickly so, as tradition holds, it can be refilled and passed to the next person. She shakes her hand at the men pouring the beer and says something spiritedly – the tone alone meant “Get this glass moving. This party has officially begun.” And we all laugh again. Sharing a meal at Souk’s home. From left to right: Ari, Maren, Josh’s mom Joy, Zall, Sukavit (expert weaver and village elder), Phout, Mai (our translator, friend and a childhood friend of Phout and Souk), and master-dyer Souk. Phout is an expert dyer and weaver. As is often the tradition in this region, the dyer is at the ‘’hub” of the weaving process. She obtains the raw silk, dyes it using only traditional natural dyes, and then distributes the prepared silk and pattern-templates to the area’s best weavers. A single piece may take a weaver several months to create. These weavers then return the completed textiles to, in this case, Phout, who will be responsible for getting them to a market. Phout is renown for her rich purples and vibrant color-play. She is also a savvy business-woman, ensuring that everyone from silk-raiser to weaver is fairly compensated. She is also eager to connect the regional talent and her silk products to a world market. Maren and Phout have become, for lack of a better word, “sisters.” We all met in 2006 quite by accident as we were touring the region as a family. We fell in love with the area, and the textiles, and … well, the people as well, like Phout and Souk. Their honesty, warmth, and open friendship has enriched us so much. These women are also central to many of the highest quality silk weavings that Above the Fray – or anyone in the world for that matter – can offer. During my recently-completed trip to Bangkok for the Queen Sirikit Museum of Textiles Symposium 2013: Weaving Royal Traditions Through Time, I took a side trip to Vientiane, Laos, where Phout met me for a few days of laughter, textiles, and local life. Maren and Phout in Vientiane early this month – dressed for an event! Phout’s mom also accompanied her to Vientiane for some dental work. Her mom wanted to sell me her blanket that she wove at age 12 (she’s maybe 70 now?) in silk with natural dyes and handspun cotton border and backing. 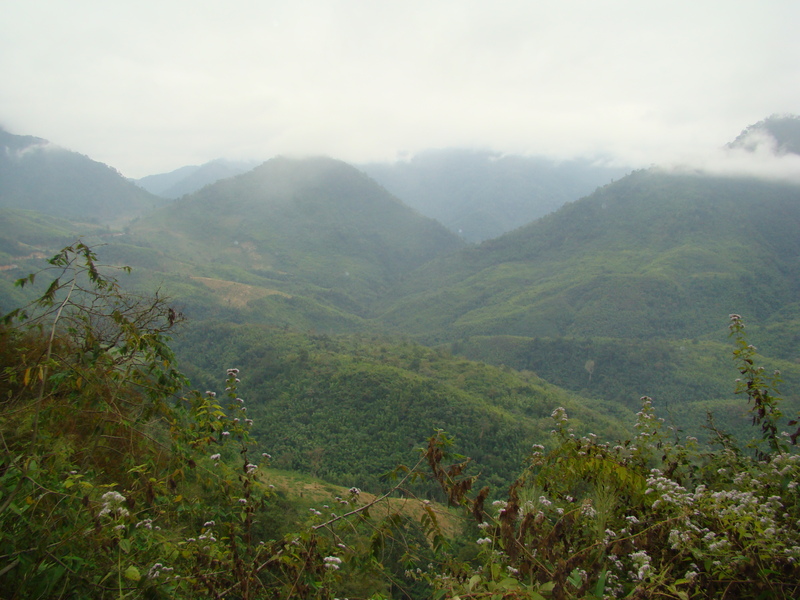 Having a treasure such as this, that survived the Vietnam war and the bombing of Laos for 9 years, is the curse of the business side of Above the Fray. No – I could never sell it. Such rarities really belong in museums. 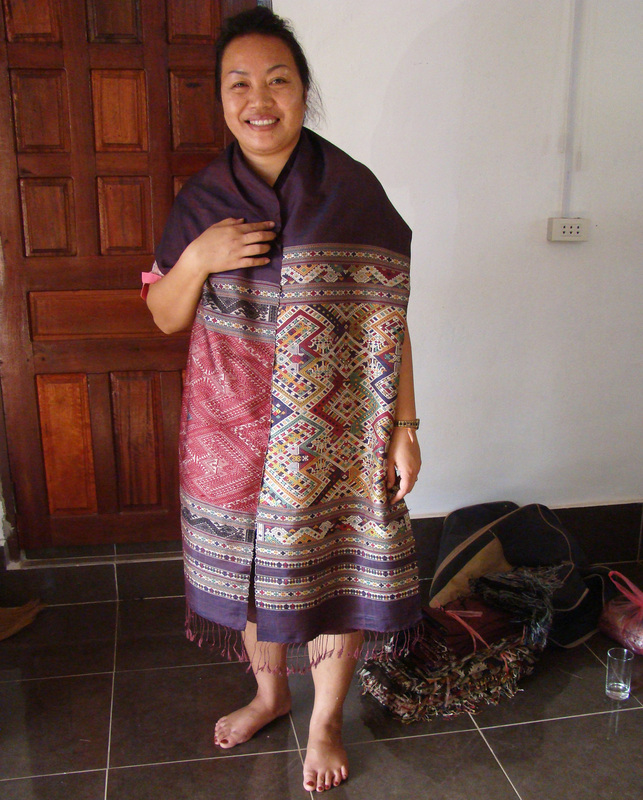 I even have a photo of Phout’s mom, also named Mai, wearing the blanket to complete the textile’s documentation. 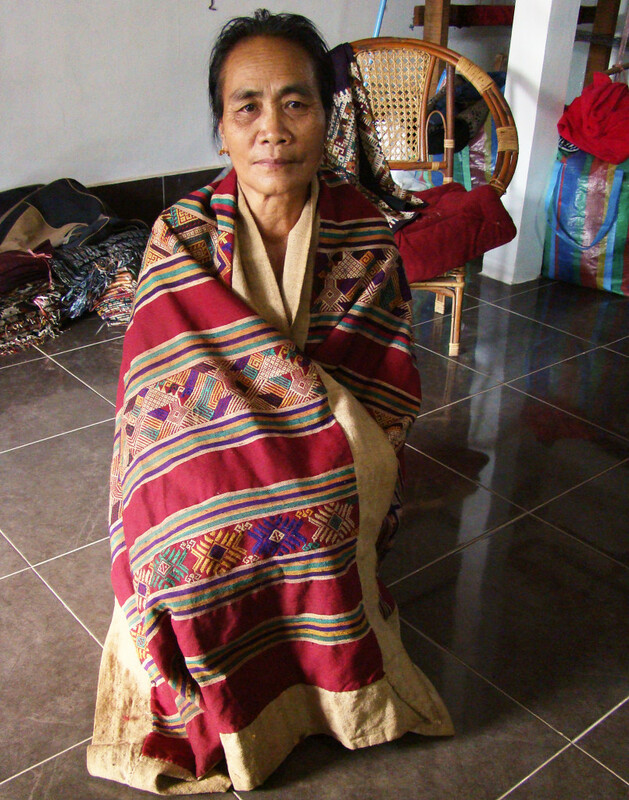 Phout’s mom, Mai, wearing the cloth she wove over 50 years ago. Phout’s daughter’s husband’s father’s neighbor’s daughter was getting married on one of the days I was with Phout. They asked if I could attend, and the answer, of course was “Yes!” I was the only “falang” (foreigner) invited to the 300+ person wedding at a fancy hotel – sit-down dinner with Johnny Walker Black and soda served to all with a live band and traditional Laos dancing – I was dragged onto the dance floor by Phout’s son-in-law, his dad, and by Phout herself – what fun! The next night we went to the main temple in Vientiane where an annual ceremony was centered for two days later – the one where people make boats out of banana leaves and float them down the river with a candle lit in them to send wishes to the ancestor world – as depicted by the “wax naga boats” on many Laos textiles. Boy was it a wild party! In addition to monks accepting donations in return for the tying on of “basi strings” for good health and good fortune (I got two! ), there were multiple (six plus stages) full of music and dancers, loud sellers of Chinese clothing, cars, motorcycles, ferris wheels, kids rides, and copious volumes of sustenance, including quail eggs, chestnuts, fried dough, barbequed dried squid, and other delicacies. Phout and I held hands the whole time. So sweet! I am honored to be considered a good friend of such a talented designer, dyer, and weaver. Dancers from the Lawae culture dance at the celebration in Vientiane. This entry was posted in Artist Profiles, Travel Ventures by josh. Bookmark the permalink.